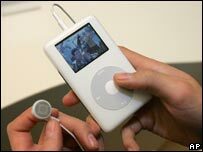 A rise in young people carrying mobile phones and MP3 players is being blamed for street robberies and muggings jumping by 8% last year. The latest crime figures include a 10% rise in gunpoint robberies. But the government says the statistics show both violent crime and crime overall has remained "stable". They come as Home Secretary John Reid unveiled plans to "rebalance" the criminal justice system away from offenders in favour of crime victims. According to police figures, the number of robberies in England and Wales rose in 2005/6 to 98,204 from 90,747 the previous year. It was the first jump since Tony Blair started the Street Crime Initiative in 2001, when offences reached a peak of 121,000. Data from the British Crime Survey - a survey asking 45,000 people about their experience of crime - suggests a 22% rise in robberies to 311,000, its highest level for four years. But BBC home affairs correspondent Rory Maclean said the survey did not really help assess the increase in muggings or street robbery. That is because the number of people in the sample was too small to be statistically significant, according to the government's number crunchers. Mr Reid said he "shared the concerns of many people that the numbers of violent offences recorded by the police have increased, particularly robbery", and pledged to buck the trend. "This is largely driven by a rise in the numbers of young people carrying expensive goods, such as mobile phones and MP3 players," he said. "Whilst this is a reason, it is not an excuse. "I am determined to reverse the rise in recorded robbery and am already taking action to address it." The Home Office is already working with 27 areas with particular robbery problems, he said. And the government says almost half of the recorded robberies were in London. But there were rises in some other regions, with robbery up 28% in Bedfordshire, 24% in Gloucestershire and 22% in both Warwickshire and Northamptonshire. However, Mr Reid says the risk of becoming a victim of crime overall is the lowest since 1981. He welcomed a 7% fall in recorded house burglaries, a 3% drop in vehicle theft and a 12% decrease in the number of homicides, despite 52 people being killed in last year's London bombings. It is the third year running that murders and manslaughters have fallen, which officials say is significant given the constant rise in homicide since the 1960s. But 765 homicides last year is still higher than the 739 seen in 1997 when Labour came to power. There was been a 36% rise in people caught with cannabis, but the government says this is due to policing changes, not more people using the drug. Total recorded crime fell by 1% to 5,556,513 offences, although the separate British Crime Survey suggested the total was up 1%. The number of crimes where somebody was charged and either cautioned or penalised was up 3% to 24%. Violent crime overall rose 2% last year, with use of handguns in crime up 7% to 4,652 offences. The number of gun killings fell 40% to 46 cases, but serious injuries from firearms incidents were up 16%. The figures are the first to give any indication of the impact of the new licensing laws which allow pubs to open for longer. But Home Office statistics chief Jon Simmons says the laws appear to have no effect on violent crime levels. Mr Simmons also said a rise in police catching people for possession of cannabis was because officers were able to give people new "formal warnings". "It does not mean more people are using cannabis," he insisted. However, shadow home secretary David Davis said: "It is shocking enough that drug offences have increased so much since the government declassified cannabis. "It is a double betrayal of a whole generation of young people that so many of these offences were merely punished with a warning." He said he was also alarmed by the rise in robberies. "This is a direct consequence of the government's failing policy of tying up our police in red tape, instead of putting them on the streets to deter and catch criminals," he said. Nick Clegg, the Liberal Democrats home affairs spokesman, said: "The rise in these violent offences is fuelling the fear of crime which runs deep in the public consciousness. "After 10 years of tough talk and confused legislation the government still has no idea how to halt the rise in violent street crime. It's no wonder that people still feel so unsafe."